Q: What happens to Canvas courses at the end of the first trimester? While I’m amazed that we’re already nearing the turn of the calendar to second trimester, I received a question today that reminded me that I needed to get some information to ICCSD teachers and students regarding what to expect. Specifically, what happens to Canvas courses at the end of the first Trimester? A: All teachers and students will continue to have access to Tri 1 courses – whether they are yearlong courses or single-trimester courses – until midnight on June 30th, 2018. This will allow teachers to work on grading, students to reference previously-submitted work and materials, and so forth. Since the courses will no longer be current, their status will change to “Past Enrollment” and won’t appear – by default – on students’ and teachers’ dashboards. 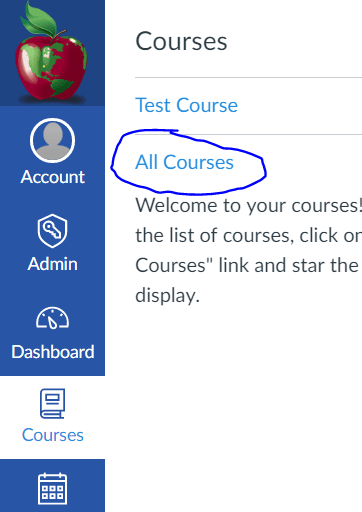 Instead, users will need to click the “Courses” button on the left side of Canvas, and then “All Courses” to show both past and current enrollments. This area will also show teachers their future courses. If you’ve read about Canvas, you may be aware that this is not the default behavior; we modified the access end dates to ensure that students and teachers can seamlessly use and reference previous course content until the end of the year.